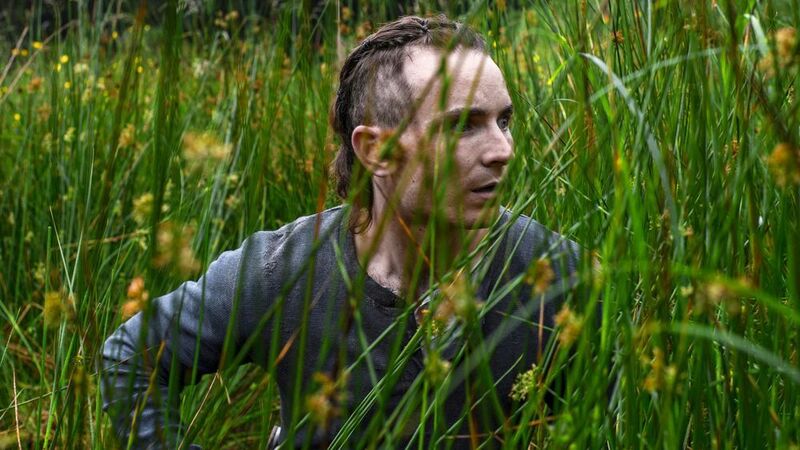 The Survivalist has a feel of The Walking Dead to it, a spin off without the walkers as we take a detour through the leafy woods to the home of the survivalist (played by Martin McCann). All that we know is that civilisation has fallen and he lives alone in a remote cabin, his survival skills honed and perfected for his threatened existence. It begins with him burying a man’s body in a shallow grave and the audience is under no allusions that he is warrior-like in his defence of his small patch of land. For the first fifteen minutes or so, we follow him silently about his daily routine of setting animal traps, washing himself, sleeping, tending to his meagre crops. It’s a stark existence, life pared back to the very basics and its fascinating. The camera pulls you in close to him, intimate with him, graphically so sometimes but we are in his world. 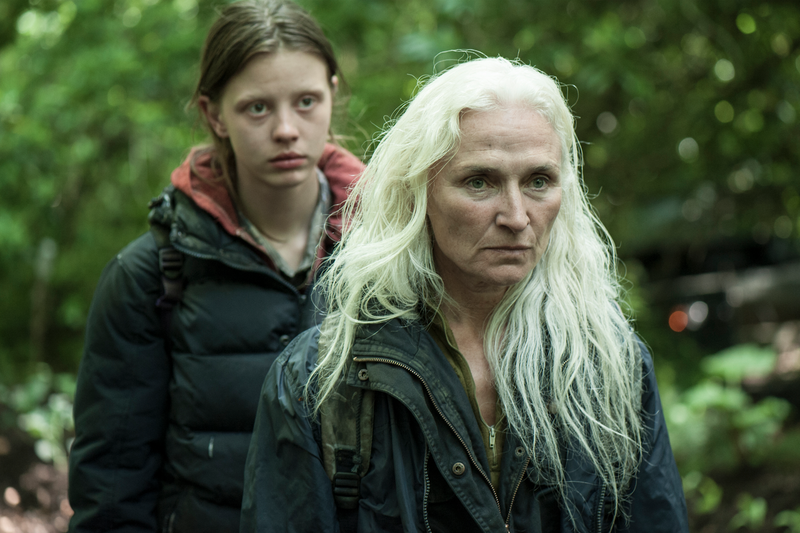 When two strangers, a woman Kathryn (Olwen Fouéré) and her teenage daughter Milja (Mia Goth), turn up on his doorstep one day, it throws his world into disarray. The young girl is offered to him sexually in exchange for shelter and food and in letting desire overrule his judgment, so begins a tension filled thriller that will test the survival instinct of each one. First-time writer/director Stephen Fingleton has fashioned a haunting tale of violence and paranoia where the slightest misstep can get you killed and the stakes are extremely high for all involved. The sparse dialogue and close setting work to Fingleton’s advantage creating a suspense filled game of cat and mouse. It’s a hugely confident debut and the casting of McCann (Shadow Dancer, ’71) as the survivalist is integral to that. He gives his all in the role bringing a mesmerising intensity, dangerous yet vulnerable in the same breath. In not providing the wider picture of what has happened to these people or the outside world, it engages the viewer to fill in the blanks and allow the intrigue of the premise to get under your skin. When the film shocks as it does, the stakes are set higher, raised by how closely the film has pulled you in. Filmed in the North, Fingleton masterfully uses sound to convey his world as if nature has her own dialogue, from the buzzing of insects on the forest floor, to rainfall in the long grass, to the human clash of a spoon scooped furiously through a watery stew and the painful hiss of a red hot poker as it cauterises a wound. While The Survivalist may be too minimalist and too dark for some, it packs a punch and delivers on its premise. 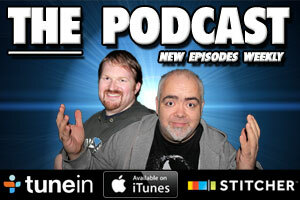 If you like the look of the trailer, then go along and witness a director and star on the rise.